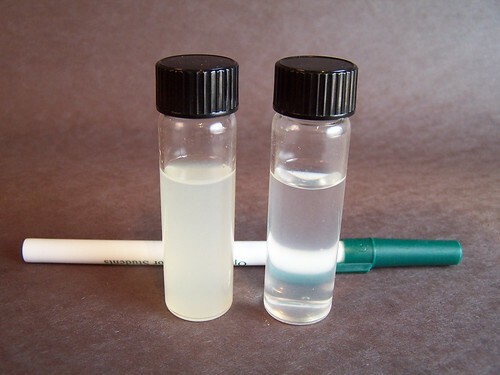 It’s been just a bit longer than a year since Dave Arnold posted his method for clarifying lime juice with agar. This month’s Mixology Monday theme also happens to be lime. Further, my local grocery has good, juicy limes selling for a mere $.39 right now. Coincidence or synchronicity? Either way, it was clear what I must do for this month’s post. Using agar clarification on juice is something I’ve been wanting to do for a while. My first experiments with agar clarification of coffee didn’t work nearly as well as using the more time-intensive gel-freeze-thaw method, but I’ve been overdue to try it with citrus. Click here for detailed directions. The basic idea is to hydrate agar in boiling water, whisk a larger amount of fresh lime juice into this solution, let set, and then filter through cloth. Sounds easy, right? Well, it is easy. Today was my first time using this method on citrus and I was able to get a yield of 170 grams clarified juice from 200 grams of fresh juice, 50 grams water, and .5 grams agar. The only complication is that I was out of muslin through which to strain it, so an ill-fitting, never-worn linen shirt found constructive use as a filter. I probably could have extracted even more juice using Dave’s “massaging the sack” technique, but I was raised conservative. The resulting juice (right) is substantially clearer than juice that’s only been fine strained (left). This being a Mixology Monday hosted by none other than Doug from the Pegu Blog, the choice of cocktail was obvious: The Duck Fart. 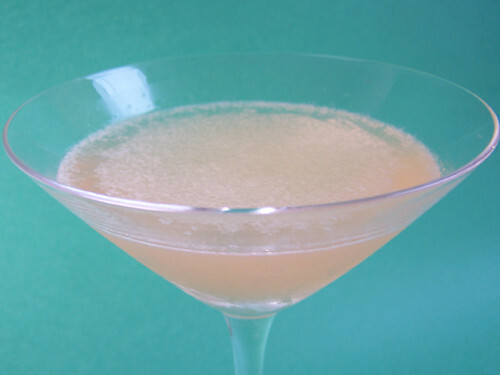 No, even better, the Pegu! The most interesting thing about this cocktail is that the flavor is so unexpected. You see a clean, transparent drink and think it’s all spirits, maybe vermouth, maybe some bitters. Then you taste it and surprise! There’s citrus all up in your face. I also tried the clarified lime juice tonight in a Pendennis Club (meh) and a Last Word (nice, though I had to add a little extra lime). The technique isn’t practical enough that I’d use it all the time, but it’s definitely an idea that can be used to good effect in cocktails. Nice! I imagine that the effect would be more dramatic in cocktails whose other ingredients are all clear. And if the cocktail you want to make includes other cloudy ingredients, why not clarify them, too? Think of a perfectly clear gin and tonic, pre-diluted, chilled with liquid nitrogen, and then carbonated (the entire drink). Awesome. Cool post, but I hate you. How the hell are you guys getting limes like that? All I can get ’round here are a few OK ones for $0.79 each, or spotty, shriveled, wrinkly things that look like old man balls. We were chatting the other day about the perlini (sic?) systems and I’ve always thought, since Evan did this at the last GADF competition, that it would be interesting to carbonate a cocktail with the perlini while using clarified juices. C.R #2s, Last words, Boulvardiers with genever :), etc. Hopefully, we will all have that opportunity when it finally gets out on the market. Also has anyone tried this clarification techniques on grenadine or orgeat? Its worth trying I guess. Oh, Jacob. I see what you did there. Re: clarified, carbonated C.R. #2. Thats the drink Eben Klemm made at the Diageo Cocktail Hour this year. I thought it sounded like a bit of a novelty, but it was revelatory. Probably the best mixed drink I had the whole week of Tales this year. FTR, I know there is no “juice” in a Boulevardier but would be fun with the perlini. No more typing comments in the morning without coffee! Does clarified lime juice keep longer than the regular kind, by any chance? I’m often frustrated by the way lime juice gets unpleasantly bitter in less than a week in the fridge. @jbr: I don’t think it keeps any longer. 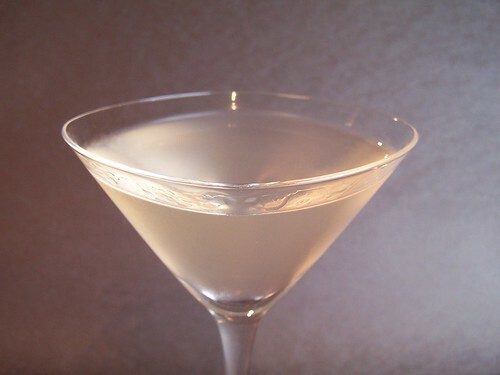 I made a tasty gimlet with clarified juice a day after making it, but I’d be wary of going any longer than that. Do you have a hand juicer, the kind that you squeeze down to juice half a lime or lemon? They’re easy to use and you can juice on the spot with minimal clean-up. Next Next post: Secret origins of White Knuckles?